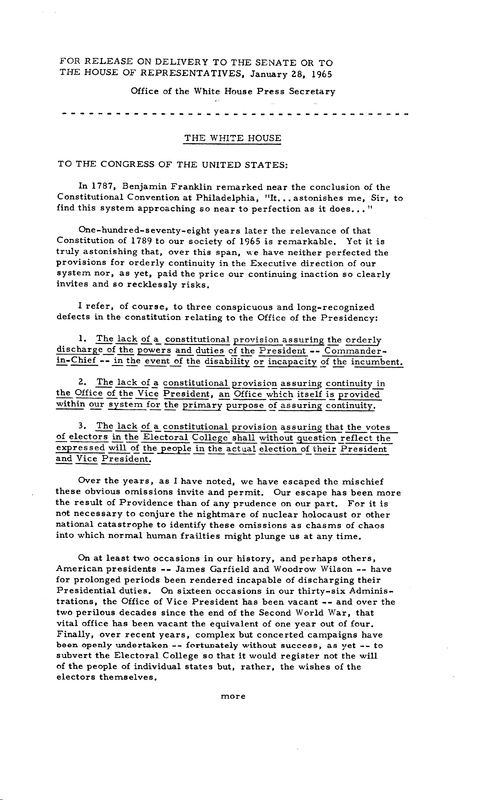 The original U.S. Constitution did not adequately provide for the transfer of presidential power in cases of temporary presidential disability or the absence of a vice president, the danger of which became evident in the presidencies of John Tyler, James A. Garfield, and Woodrow Wilson. 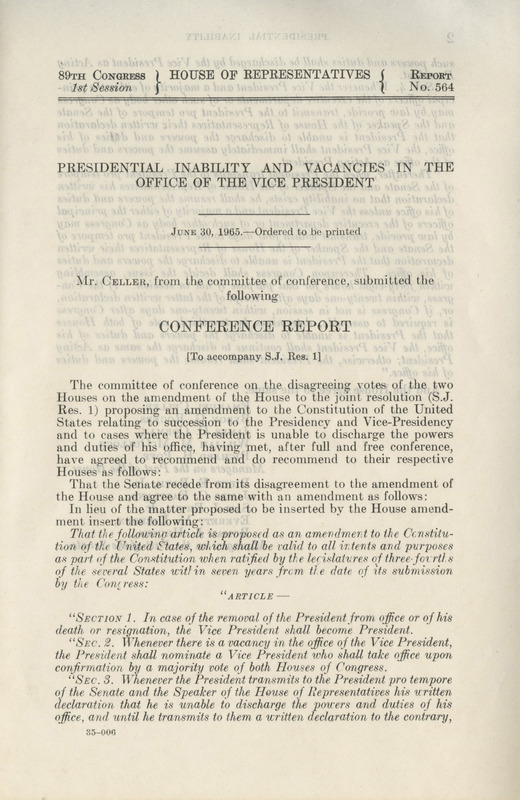 The powers of the vice president, the line of succession without a vice president, and how to determine the inability of a president to fulfill his duties required clarification. 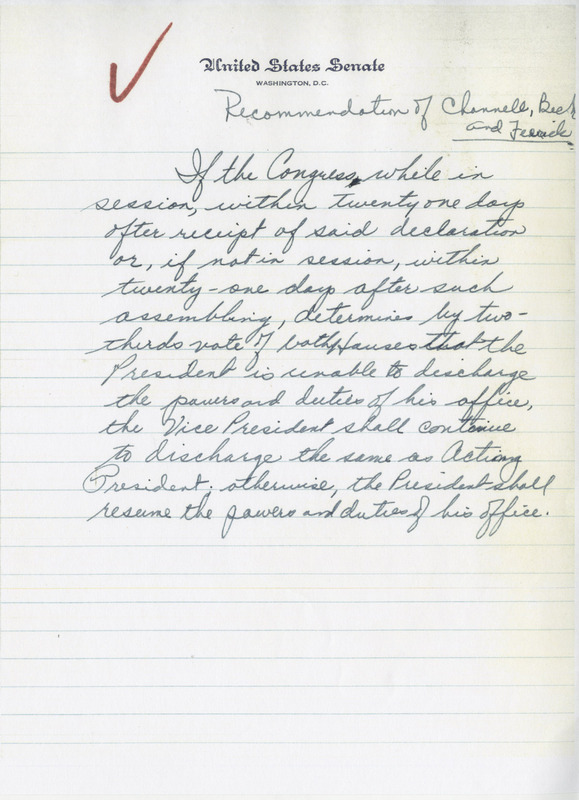 After serious health challenges, President Dwight D. Eisenhower sought to clarify procedures through a signed agreement with Vice President Richard Nixon, drafted by Attorney General Herbert Brownell. President John F. Kennedy and Vice President Lyndon B. Johnson followed this pattern, but these agreements did not carry the authority of a constitutional resolution. 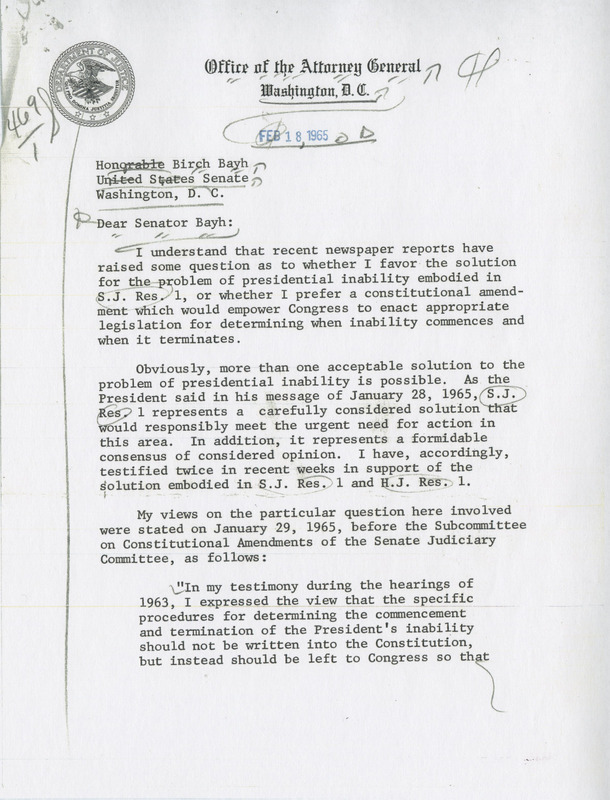 In April 1958, Estes Kefauver (D-TN) led the Senate Judiciary Committee's Subcomittee on Constitutional Amendments to consider a proposal similar to that embodied in the Brownell agreement but with some modifications. 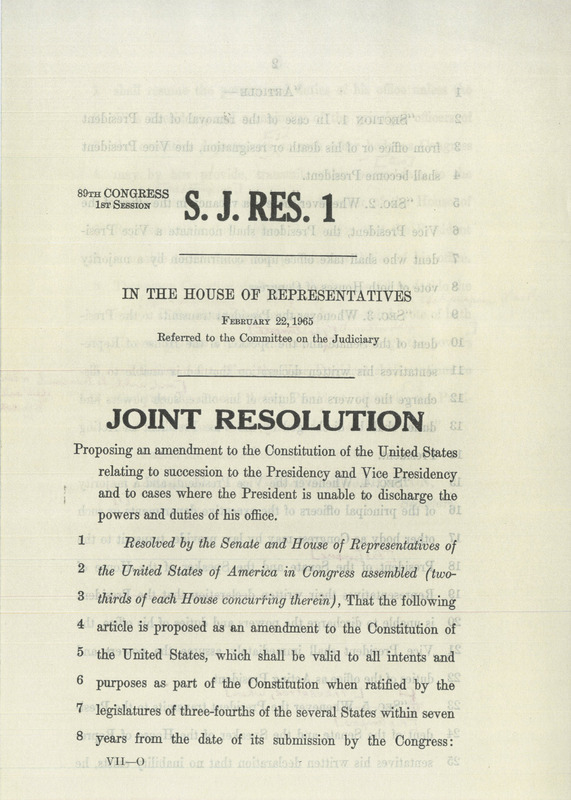 He reintroduced the proposal in the 86th Congress (1959-1960), and in 1960 the American Bar Association undertook an extensive study resulting in the recommendation for a constitutional amendment granting Congress the power to establish procedure in the event of presidential disability. With the inauguration of a new, young President in 1961, concern subsided somewhat, but Kefauver persisted. 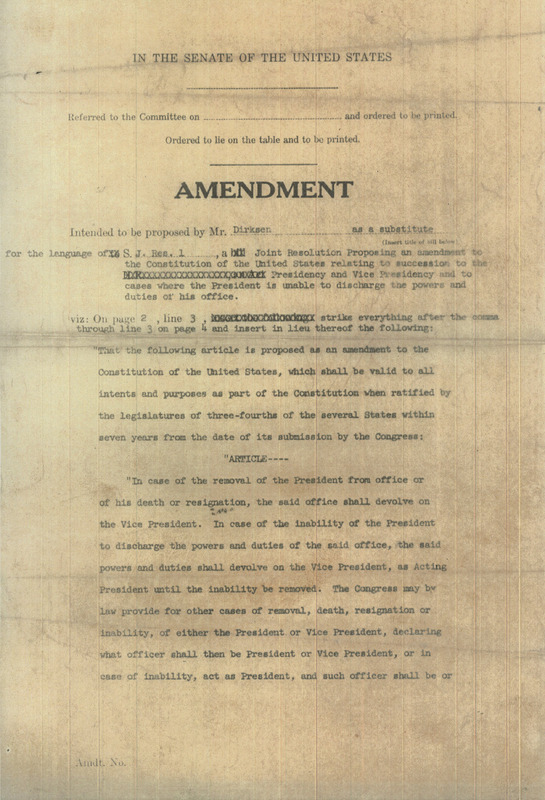 Two possible remedies emerged in the form of proposed constitutional amendments: Kefauver's S. J. Res. 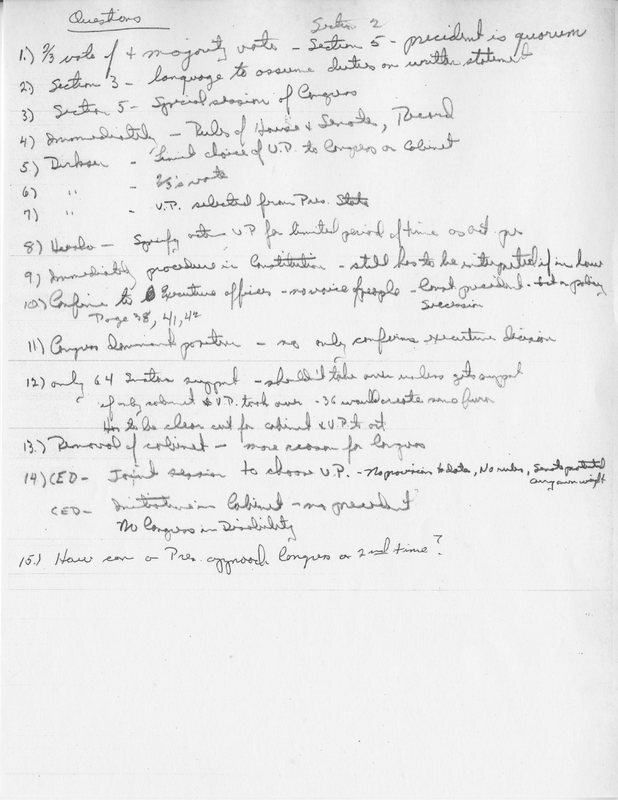 28, specified criteria and procedures in the case of presidential incapacity as the Brownell agreement had done, and Kenneth Keating's S. J. Res. 35, proposed enabling Congress to establish procedure. Kefauver joined in sponsoring the Keating amendment. 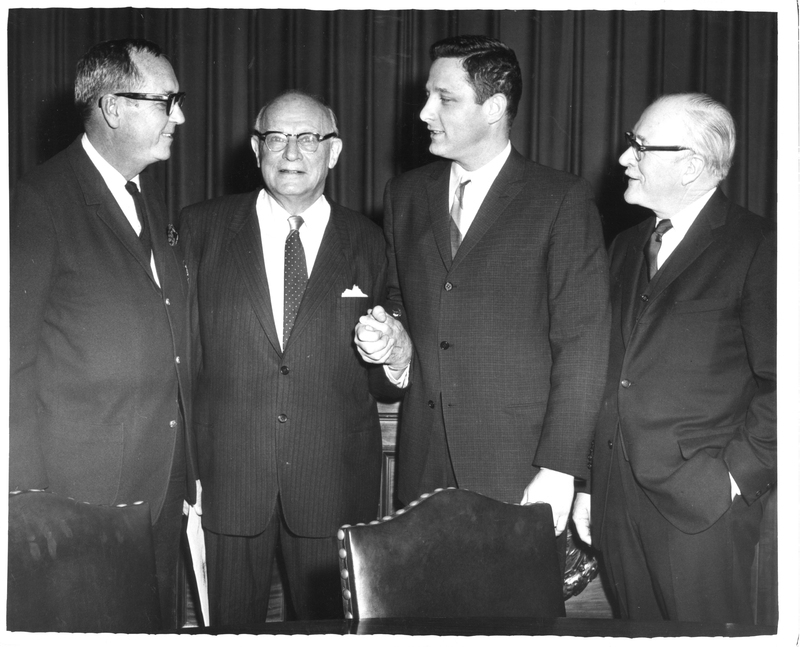 Two months later, Kefauver died of a heart attack, leaving the Subcommittee on Constitutional Amendments without a chair and facing termination by Judiciary Committee Chair James Eastland (D-MS) in the face of pressure to cut committee budgets. Birch Bayh, a freshman senator from Indiana, asked for and received the chairmanship of the subcommittee at the end of September. 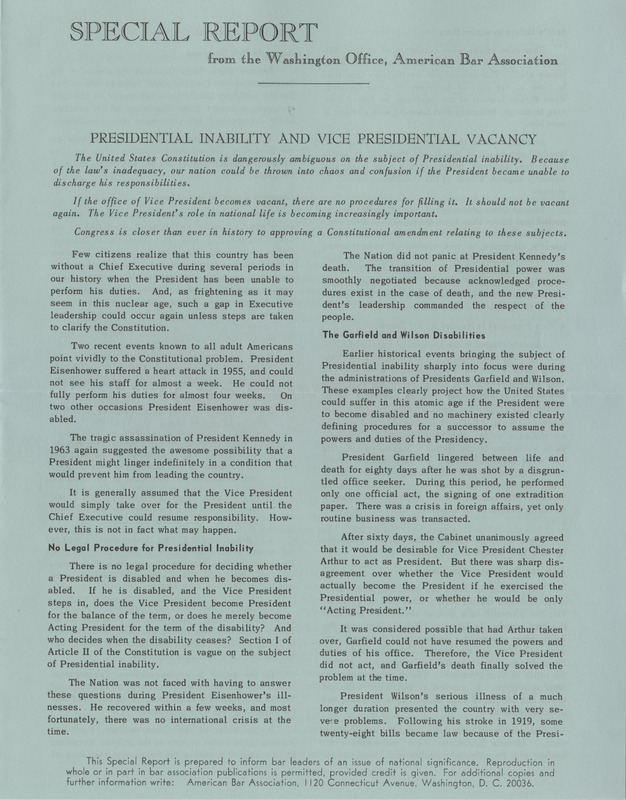 The assassination of President Kennedy on November 22 propelled the issue to the forefront, leaving a vacancy in the vice presidency that would remain until the November 1964 election. On December 12, 1963 Senator Bayh introduced S. J. Res. 139. Following Senator Birch Bayh's introduction of S.J. Res. 139 in the 88th Congress, the American Bar Association held two conferences on Presidential Inability and Vice Presidential Vacancy, and the Subcommittee on Constitutional Amendments held joint hearings on the two issues. 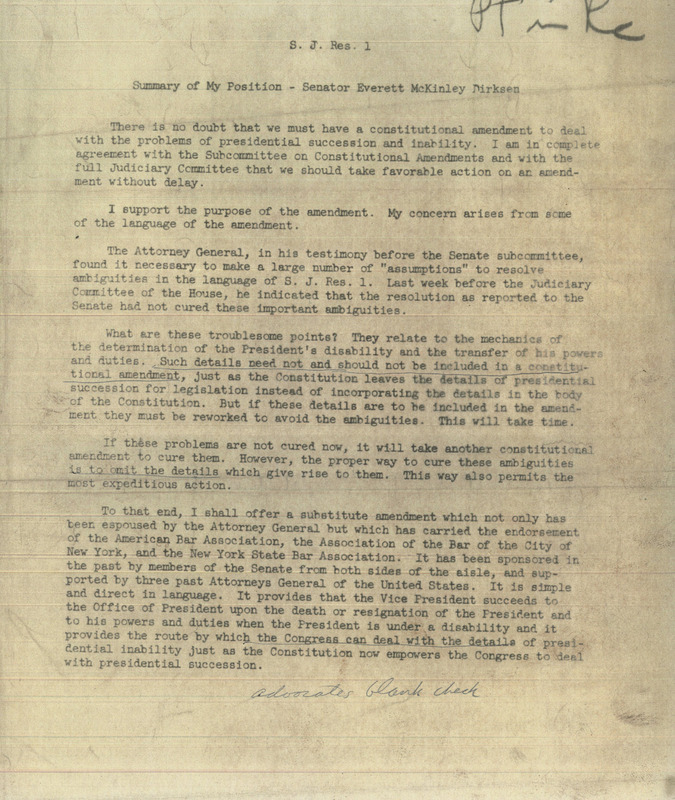 The insights of former President Eisenhower, which advised replacing the Speaker of the House in the chain of succession with a sequence of Cabinet members, were sought and incorporated. Knowing that the House, despite having 22 proposals related to Presidential disability and succession before it, was embroiled in immigration legislation and the Civil Rights Act of 1964, Bayh and his staff decided to concentrate on passage in the Senate in order to enter the new Congress with that foundation of support. A key barrier was Senator Ken Keating of New York, who had favored an enabling amendment rather than one specifying procedures in the event of Presidential disability. On March 26 he sent Bayh a letter with a detailed analysis of S. J. Res. 139, including his commitment to support it if the change in succession could be deleted. The revised S. J. Res. 139 that was reported by the Subcommittee on Constitutional Amendments to the Judiciary Committee on May 27, 1964 and then on August 13 by the Judiciary Committee to the full Senate with unanimous support had stripped out that portion. On September 28 it was passed by voice vote, but John Stennis of Mississippi pointed out that only nine senators had been present for a vote that would amend the Constitution and asked for a reconsideration of the vote. On September 29 S. J. Res. 139 passed by a roll call vote of 65-0, but when Congress adjourned on October 3, no further action had been taken. It was thus in the 89th Congress that the final battles were to be waged. The chair of the House Judiciary Committee, Emmanuel Celler, had come on board to support S. J. Res. 139 in late May 1964. Since the 65 senators present for the vote had approved the amendment and another 20 had indicated support, the task in the 89th Congress appeared to be simply to marshall support in the House and coordinate Senate efforts for speedy passage. Identical bills were introduced in the House and Senate in the first week of January by Celler and Bayh respectively. Bayh introduced S.J. Res 1 on January 6 while he continued to gather co-sponsors, who are indicated by a check mark by their names on the attached Senate roster. 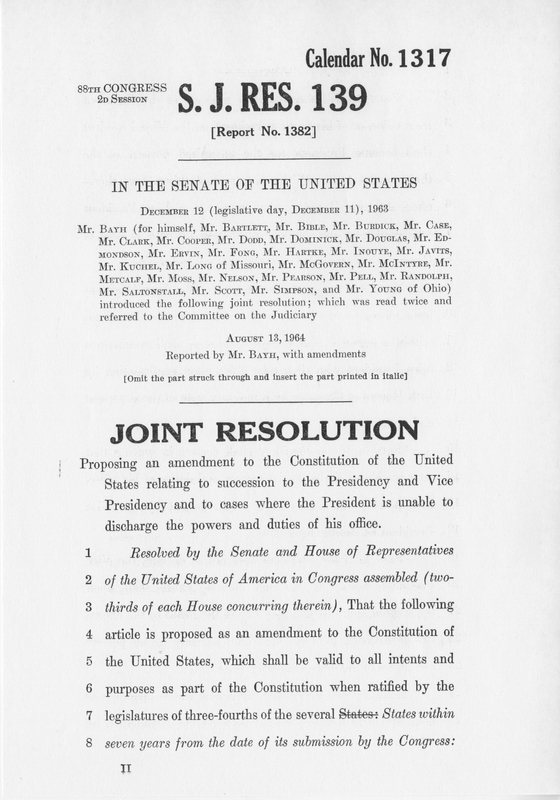 The 1,530 copies of the resolution ordered printed included the names of those cosponsors. The American Bar Association as part of its effort to mobilize public support. Bayh and his staff had managed to line up 72 cosponsors and they reached out to the White House, resulting in a mention of succession legislation in the State of the Union speech. On Jan 28 the White House sent a full-fledged endorsement of S. J. Res. 1 to the Congress. But differences within the Senate quickly surfaced. Senator Keating had been defeated in the November election, but his objections were taken up by Roman Hruska, a new member of the subcommittee, during the January 29 hearings. 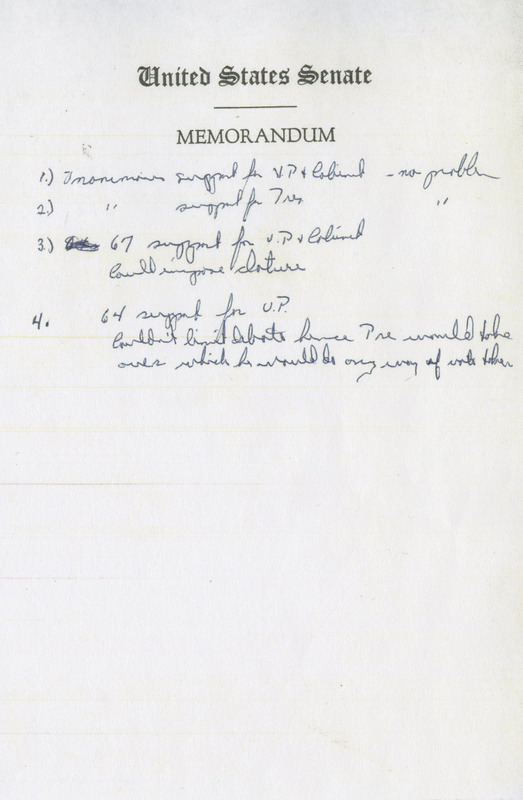 Bayh’s notes indicate that the full range of concerns about language resurfaced as well. Nevertheless S. J. Res. 1 was reported out to the full Judiciary Committee on February 1 with a text identical to what had been approved by the Senate the previous October. 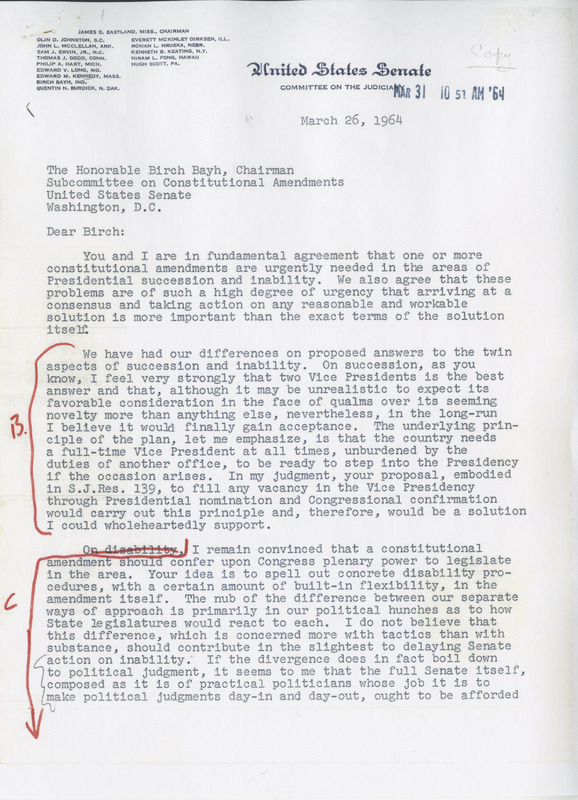 With pressure from Senator Majority Leader Mike Mansfield to bring the amendment to the floor as quickly as possible, Judiciary Committee Chairman James Eastland anticipated a brief period of debate and a vote to report the amendment. However, Roman Hruska objected to the fact that no prints of the January 29 hearings were yet available and indicated his intention to hold the matter over a week. 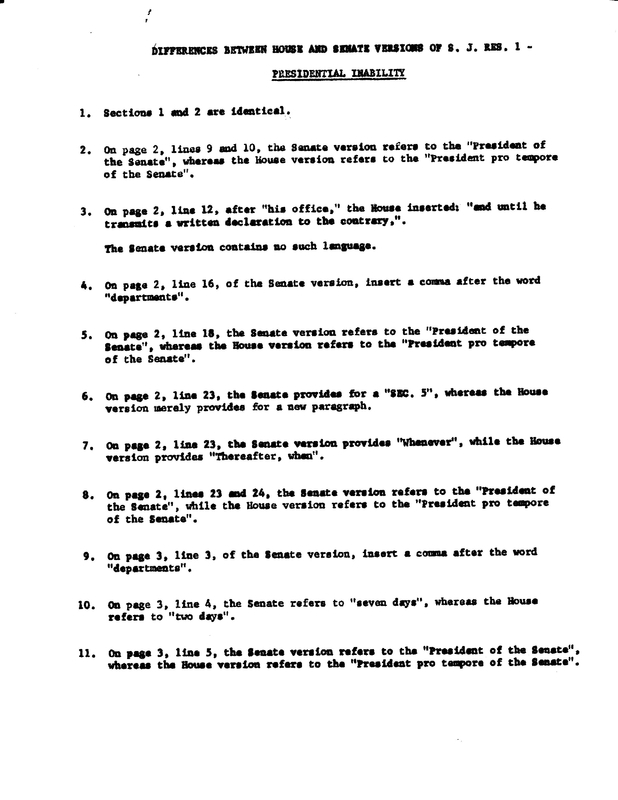 Bayh offered to have his staff makes copies of the just-received first print for any senator who wished to have them and the committee agreed to hold the matter over for one day but then commit to meet at 10:00 and vote by 11:00. By the end of the day, the two committee members who had accepted the offer for copies of the hearings had them in hand. Meanwhile it had become clear that Everett Dirksen, who in the previous Congress had been absorbed in the battles over the Civil Rights Act of 1964 and so had seen fit to let S. J. Res. 139 move unimpeded toward Senate passage, was now focused on its successor, S. J. Res. 1, emphatically taking the position Keating had for an enabling amendment only. At the opening of the February 4 Judiciary Committee meeting, Dirksen presented a surprise amendment to S. J. Res. 1 that would have essentially gutted the resolution of language laying out specific procedures for handling presidential disability. In the House, 32 proposals regarding Presidential succession had been introduced. Hearings were scheduled to begin February 7 before the full House Judiciary Committee, chaired by Emmanuel Celler, on the first day of which Bayh was to appear. 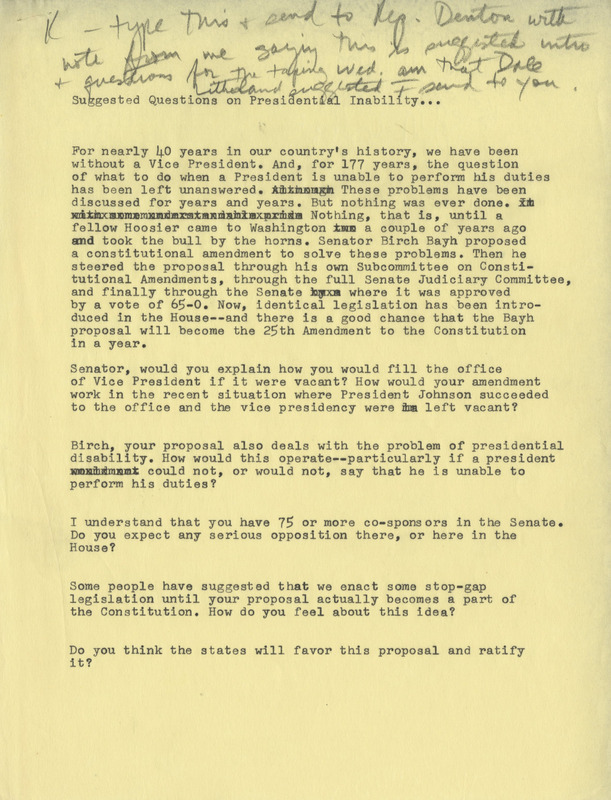 In preparation his staff forwarded possible supportive questions to Indiana congressman Winfield Denton, but Bayh found himself instead fielding continuous challenges to the wording of various sections arising from numerous hypothetical scenarios that members felt were not adequately addressed. The House hearings continued for 17 days and generated 292 printed pages of testimony. On February 18, the day S. J. Res. 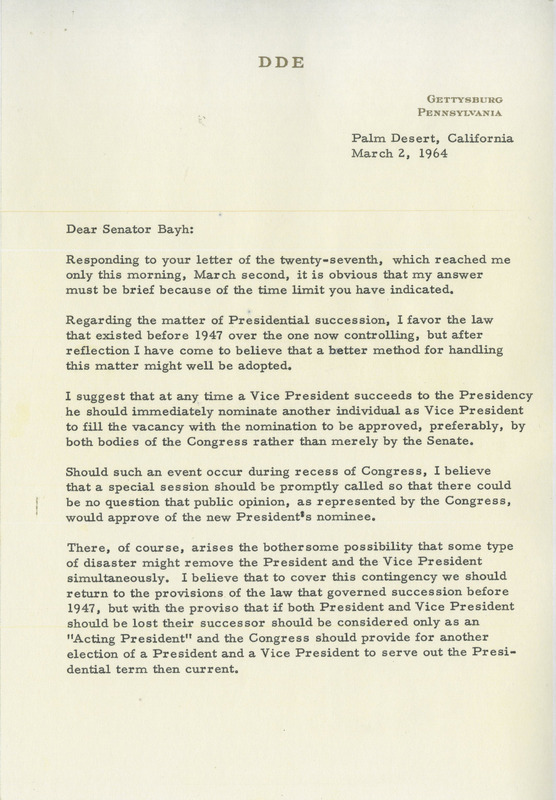 1 was to be the pending order of business in the Senate, press reports made Bayh and his staff aware that Everett Dirksen might join Roman Hruska’s effort to replace the resolution with an enabling amendment only, arguing that Attorney General Nicholas Katzenbach actually favored that alternative and that his apparent support for S. J. Res. 1 was the result of White House pressure. A postponement of debate gave Bayh’s staff just enough time to obtain a firm written statement of support from Katzenbach to counter any possible move by Dirksen. 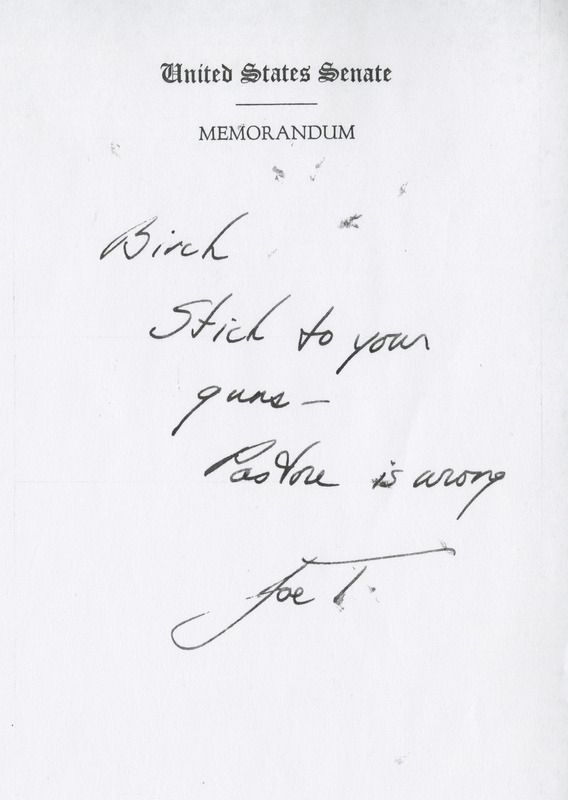 When Bayh began to consider accepting from John Pastore an amendment to strengthen the wording mandating immediate consideration of disability by Congress, his colleagues, including Joseph Tydings urgently pulled him back from an action that would have resulted in sending the resolution back to committee, perhaps never to emerge again. He stood his ground, the amendments were defeated, and S. J. Res. 1 passed the Senate by a vote of 72-0. On February 22 S. J. Res. 1 was delivered to the House, where it went to the House Judiciary Committee, which had only concluded its hearings on the companion bill, H. R. Res. 1, the week before. On April 13 S. J. Res. 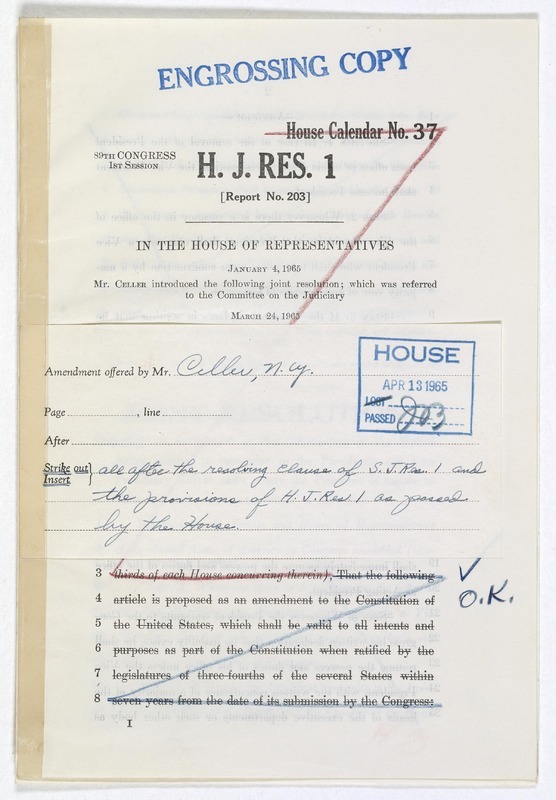 1 was debated in the House and on April 22 was returned to the Senate with minor revisions, among which was a limitation on the time Congress could take to declare disability. Realizing that senators could be predicted to see that as a violation of their tradition of unlimited debate, Bayh requested a conference committee and on April 28 the House insisted on its amendments and agreed to a conference. 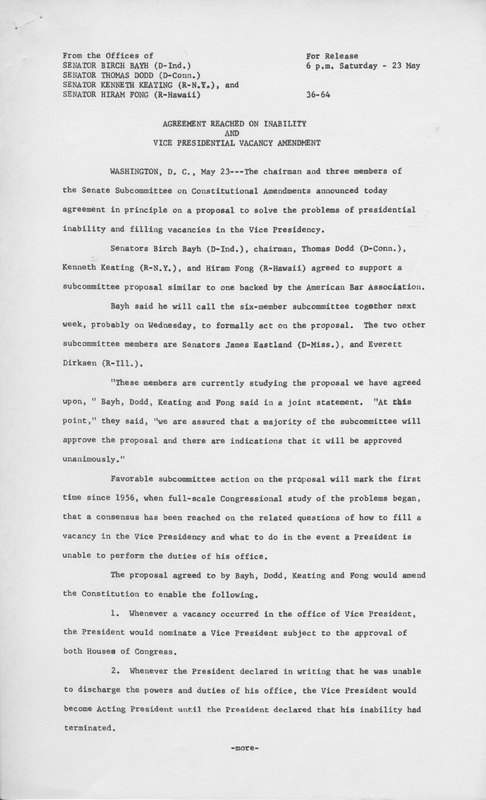 On May 10, the Senate conferees met to prepare for the initial conference meeting the next day, where presenting a united front would be essential. A comparison of House and Senate versions of S. J. Res. 1 was to be their departure point. 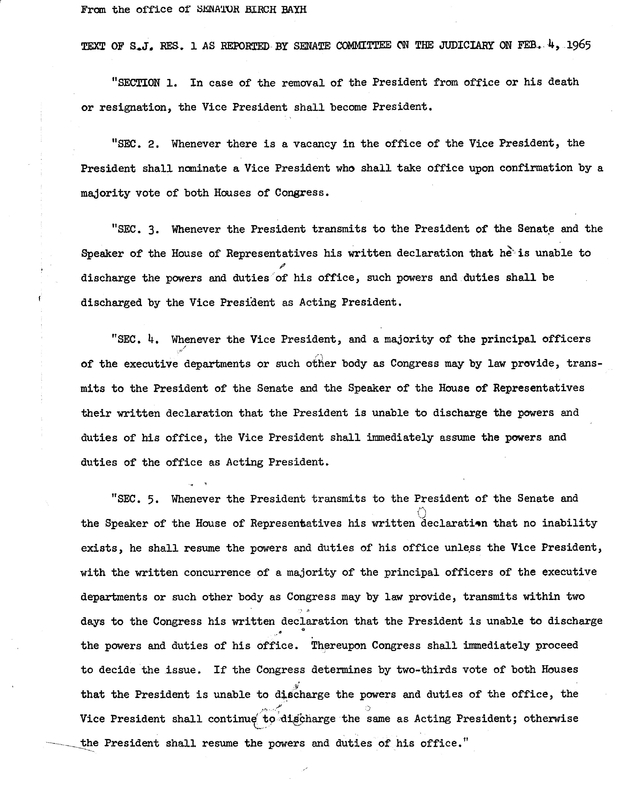 Three areas of disagreement emerged between House and Senate versions, all involving time: the period of time during which the Vice President and Cabinet must decide whether they disagree with the President’s declaration that he is fit to resume his duties (two days versus seven); the time before Congress convenes to resolve the issue between the President and the Vice President and Cabinet (48 hours versus the less specific “immediately”); and the time-limit for Congress to reach a decision (10 days versus no specific time limit). 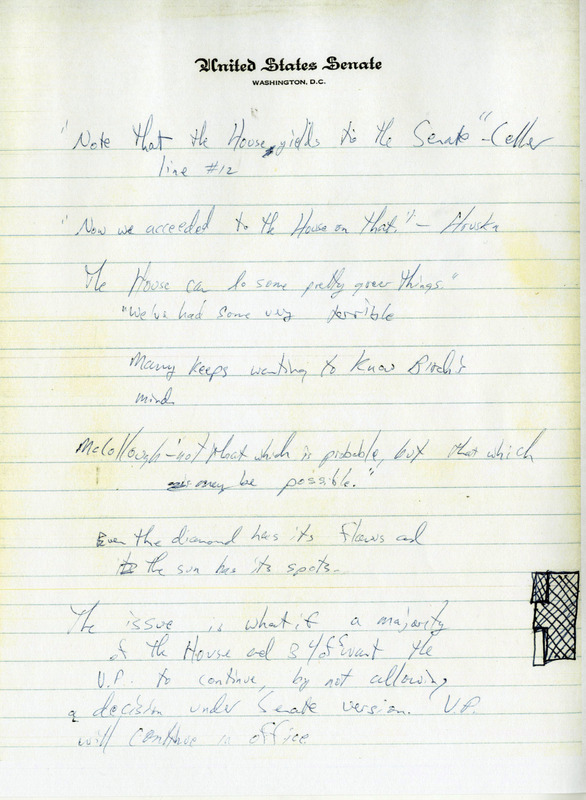 Bayh’s notes hint at the hypothetical situations posed in order to test the two versions. On the first two points compromise was reached, but the third ran up against the Senate’s insistence on unlimited debate, and negotiations stalled. Despite direct work between Bayh and Celler and drafts of language by legal experts. Compromise was reached, but the third ran up against the Senate’s insistence on unlimited debate, and negotiations stalled. Despite direct work between Bayh and Celler and drafts of language by legal experts It took the mediation of Lewis Powell of the American Bar Association with Celler to arrive at the final formulation of S. J. Res. 1 on June 10. On July 6, 1965, it was passed by both House and Senate. 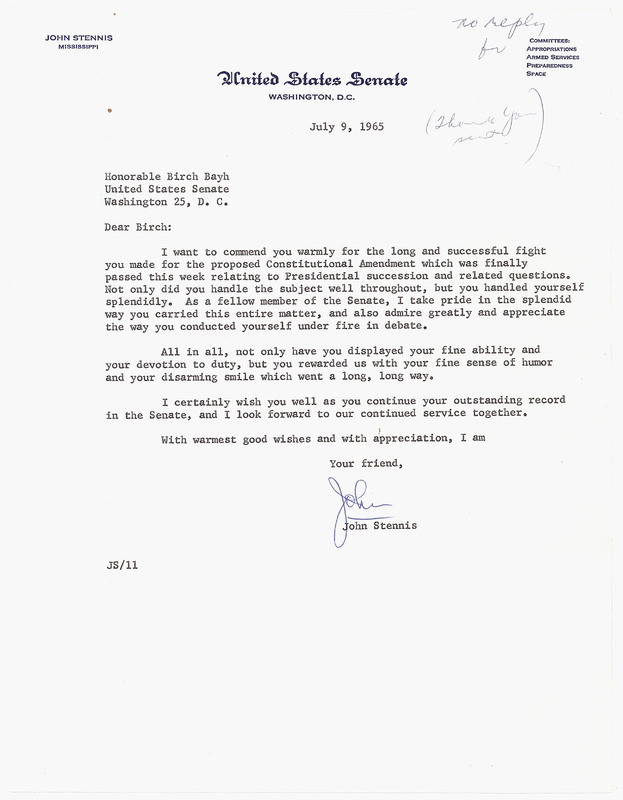 On July 9, 1965, Senator John Stennis (D-MS), a senior, highly esteemed member of the Senate, sent the young Senator Bayh a note of congratulations commending him for “the splendid way you carried this entire matter.” Ratification was completed on February 10, 1967 when Nevada became the thirty-eighth state to approve the proposed amendment. In eight years it would undergo its true test, when a vice president would resign in disgrace and under threat of impeachment a president would also resign. The 25th Amendment passed that test with flying colors.